If this book is about one thing, it's about prayer. 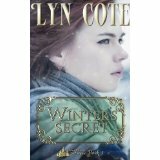 "In Winter's Secret" by Lyn Cote, a Home Health Nurse named Wendy, is followed through the heavy snow by a burglar. The homes where she visits are entered by this person after she and her patient leaves for care. She prays not too many of her patients will become harmed or fatally wounded. In the meantime, she and Sheriff Rodd deal with personal issues. Parts of "Runaway: How a Slave Defied America's First President" by Bill Donahue had its boring parts. Still, I will never forget Ona Judge, the runaway slave. And of course, I will always remember George Washington, our first president. The story describes his strengths and weaknesses along with the strengths of her character. Ona Judge was a strong woman. When she finally experienced freedom, she chose it over living in slavery ever again. Although she was the close friend of Martha Washington, George Washington's wife, she still hungered for freedom. Friendship and nothing else comes close to the ability to come and go as you please, in other words, to make decisions for your life is kingpin. It's exquisite like fine china. 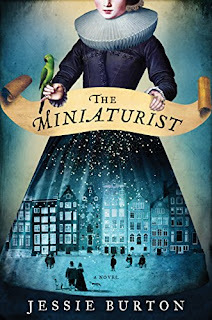 The Miniaturist by Jessie Burton is also a well patterned garden maze. A reader might find themselves lost in streets because there are many lives to live here. More than one life story lives in each character. It is uncomfortable to read about one household's days of chaos. A large cabinet house bought by Johannes, the husband, for his bride, Petronella, will become more than an upright toy. For a while, it is a child bride's safe haven. The household is full of puzzles and whispers. So are the streets of Amsterdam. In this novel, words and deeds are like "water." What is spoken or done inside flows outside and is judged. I am still thinking about "The Haunted Lighthouse" by J A Whiting. I don't want to call it a cozy. I would like to call it a Romantic Suspense or Mystery. The relationships are complicated. It's a reality based book. I am still a bit melancholy. Therefore, this book cover entered my mind. What happened to this woman in black? Days ago I read the beginning of this one. It's very violent. So brutal I closed the book. Then, I came back again because of the title. What does it mean "It Should've been me?" What happened here? Since Reshonda Tate Billingsley and Victoria Christopher Murray are two authors I dearly love, I trust that this is another drama that will take me places that are, perhaps, uncomfortable but worth my while in examining. In "The Haunted Lighthouse" by J A Whiting, ghosts and visions appear to Lin. All of their history is played out around the Nantucket Lighthouse. These ghosts are sad. The male and female, husband and wife, Julia and Benjamin, appear together. Only Lin sees these spirits and visions. It's a love story and a family history. If you've ever wanted to tell someone 'get on with your life, forget about it,' read this cozy. The past can lead to death, the death of other people and also sweep across generations causing a spirit of melancholy. It's a meaningful read for any time of year. Let's think of the closest love holiday, Valentine's Day. If someone doesn't love you back, let them go! Don't stalk them. Don't hate and hurt new people who come in your life. Adjust and find a new love. It might take time. Still, there are plenty of fish in the sea. Usually, I settle down and read a book very quickly. I finish one. Then, it takes hours to move on to another. I hear all the recommendations in my head. Each book that a friend offers me to read seems like the best one. It comes down to counting my toes and fingers and thinking about This Little Pig Goes To Market. Since I am a bibliophile, I have to read. So, I grab one, any one. Next step is feeling guilty because I didn't choose the one you, reader friend, wanted me to read. Last step is bliss. The book I've chosen keeps my attention. I read fifty pages. I put it down with a pa of satisfaction. All through the day, I think about getting back to the page where I left off. This is such a good Christian novel. It is about marriage and dancing. From the moment, her husband, Jim, decides not to share a dance with her during their wedding, she becomes rather unhappy, unfulfilled. Little did she know on that happy occasion, her husband would never share a dance with her not for twenty - seven years. It is finally made known he's lived a life of fear down to his very feet. In "The Dance," all sorts of interesting concerns arise as Jim and his wife, Marilyn, dance. The family takes sides. Then, the big word, the fearsome word, humility comes in to play. It is a frightening term because it makes people in a relationship feel vulnerable. There is the stepping out in faith and knowing you might get your Fear feet stepped on. Ouch! In life, there are times when people must make big decisions. Decisions which will change their whole lives. In "Proper Goodbye," by Connie Chappell there are life changing decisions about careers, health and relationships. Along the way, there is the subtle reminder that what we choose to do or not do or how we choose to do it will have consequences. While peace and love of life always seem to surround the life of the Amish, there is also room for danger in this Ohio town. In "The Seekers" by Wanda E. Brunstetter, It happens at the house of Heidi and her husband, Lyle. He is a stranger with RV problems who stops at their home. He is invited to remain on the premises until the RV is ready to move him forward again. How nice of these busy, kind people to give such an invitation. However, what is the stranger really like? You have to wonder if the time of acting as a good Samaritan has come and gone during an earlier era. Sadly while God still works miracles and still answers the prayers of those who pray in the novel, there is the fact that people are led by their fleshly temptations. Those who call themselves God's lambs must suffer in unexpected way. It is time to grow vigilant. When fishes flew and forests walked And figs grew upon thorn, Some moment when the moon was blood Then surely I was born. With monstrous head and sickening cry And ears like errant wings, The devil’s walking parody On all four-footed things. The tattered outlaw of the earth, Of ancient crooked will; Starve, scourge, deride me: I am dumb, I keep my secret still. Fools! For I also had my hour; One far fierce hour and sweet: There was a shout about my ears, And palms before my feet. Unexpectedly, a surgeon and his family become involved in a Civil Rights Protest march. In "Inner City Blues by Chicki Brown," it's easy to see how circumstances can involve us in the lives of other people especially family members. In this instance, the shooting of two family members brings danger and secrecy to the home of Dr. Stafford.